Jochen Rindt was the dominant driver in F2 in 1968, winning six races in his Roy Winkelmann Racing Brabham BT23C, including four European Trophy races. As a graded driver, he was not eligible for the championship which was dominated by the two Matra works drivers, Jean-Pierre Beltoise and Henri Pescarolo. Tino Brambilla joined the Ferrari team in August and was immediately successful, winning outright at Hockenheim and Vallelunga in October to jump into third place in the championship. BMW returned to F2 late in the season with a pair of new BMW-designed, Lola-constructed T102s and a new engine but had limited impact. Jackie Stewart also won three non-Trophy races in his Matra MS7, run by Ken Tyrrell, Jonathan Williams won one in Frank Williams' Brabham BT23C and Chris Irwin also scored a singleton victory in the works Lola T100. Had there been a constructors title, it would have been won by Brabham on 142 points from Matra on 123 and Ferrari on 56. These would have been followed by Lola (29), Lotus (27), Tecno (25), McLaren (20) and Chevron (3). A hypothetical team championship would have been won by the works Matras of Matra Sports, followed by the Brabhams of Roy Winkelmann Racing, with Ferrari third, Frank Williams' new operation in fourth, Ken Tyrrell's Matra International fifth and Gold Leaf Team Lotus sixth. Beltoise scored maximum points in five races as he also finished second to graded driver Jochen Rindt (Brabham BT23C) at Thruxton and Tulln-Langenlebarn. Courage scored maximum points at Enna, also by finishing second to Rindt, as did Redman at Crystal Palace. Only Ferrari and BMW offered any challenge to the dominance of Cosworth's FVA engines. The 6-cylinder Ferrari Dino 166 was powerful but heavy and was essentially now a very old design. BMW abandoned their tall 1967 Apfelbeck radial valve engine for a new four-valve, three-plug design derived from their successful touring car engine. Both engines claimed 225 bhp in 1968. A short series of races was held in Argentina at the end of the year which attracted a very strong entry from the European teams. Several locals bought cars for the series, the quickest of whom was Andrea Vianini in his Tecno. The 1969 Formula 2 race results - drivers, positions, laps completed and grid positions - were collated by Rob Ryder using a range of sources including the F1 Register Black Books. 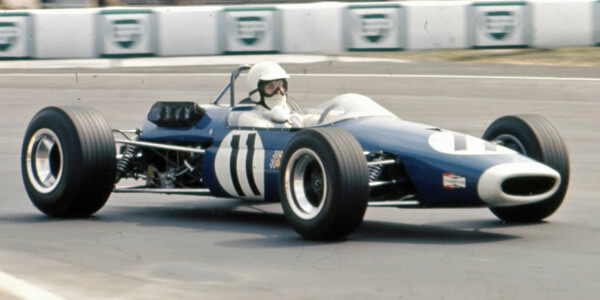 Chassis identities were then added by Allen Brown using Race Report , Autosport and Motoring News as his primary sources.